Author E.J. Morris, also known to many as Doc Morris, knew what he wanted from the self-publishing experience … and he wanted outstanding customer service, a straightforward and easy-to-navigate publishing process, and a high-quality finished product. We at Outskirts Press had the privilege of publishing his book, The Modern Day Mr. Mom, in May of 2018. The book, which takes inspiration for its title and theme from John Hughes’ screenplay for the 1983 classic film Mr. Mom, chronicles the sum total of Morris’ experiences as well as the lived experiences of stay-at-home fathers everywhere. While there is no “how-to” template for successfully managing life as a parent and homemaker, The Modern Day Mr. 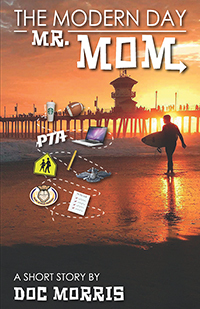 Mom sets out to provide a toolkit for those who maybe need just a little bit of extra encouragement in navigating our busy world and its multitudes of demands. Morris, who was inspired to write this book by the words and wisdom of his own late father, continued to provide support and encouragement even after the book’s publication in a letter he wrote to thank his Outskirts Press Author Representative, Jamie Rath, and his Publishing Consultant, Kirsten Ringer, for their work on his behalf in ensuring he had the best possible self-publishing experience. With his permission, we are providing the full text of his letter here for you to read, as we believe it represents the best of what Outskirts Press has to offer: an unmatched, personalized, deeply human publishing service. My Author Representative and Publishing Consultant had gone the extra uphill mile(s) to ensure that my what ifs and oh by the ways were always answered in a timely manner to meet the timelines for my revised review(s) process with a mountain of patience. Needless to say, I never felt as if I were wearing out my welcome. My manuscript from the digital author galley days to the end was “smooth” as a handoff from quarterback Vince Ferragamo to Hall of Famer running back Eric Dickerson. The end product as well, from the official release on Amazon and Barnes & Noble, was also seamlessly coordinated like a baton handoff in the changeover box in the track-and-field one-mile relay world, thanks to Jamie’s attention to detail. Jamie and Kirsten, on the aforementioned dates, spearheaded what started out as a joke with my bedridden father one day when he asked, while I was taking care of him, “So what do you have going on today?” After a few minutes of running down my laundry list of tasks, appointments, and what I was planning on cooking for my four boys and wife for dinner, he gave me the time-out signal and wrote on his whiteboard: “Information overload, quit.” Although he passed away on Veterans Day in 2015, I kept to my end of the bargain and wrote a book about overcoming a mountain of challenges and tasks once I retired from the U.S. Navy, in a more modern arena as I took the role of Mr. Mom. Five days before he passed away, my father mouthed the words: “Finish that book ….” This was the least I could do after my wife had towed the line raising our four boys alone while I was forward deployed multiple times, eleven years in total away throughout my twenty-year career in the military. Jamie even quarterbacked some questions that arose while my wife was in the hospital on one occasion. I will never forget that! This ideology of her enthusiasm is what motivated me to press on during the process, even when time was thin. Patience is what builds character, right? Once Kirsten reassured me my manuscript had a chance with a targeted audience (the modern-day domesticated homemaker), and with Jamie’s assurances as a multitasking Mom herself, I immediately felt more confident that my stories would spark those stay-at-home dads to “get off their rear and volunteer.” Whether helping grade papers for their kids’ school, chaperoning field trips, or just playing tetherball during recess with the other kids, all I was trying to drive home was that in a short few hours out of a dad’s schedule, we all have multiple hats to wear throughout the day. I was able to write about all the variables I overcame with four boys — two of which are living at home while attending college, and two of which have special needs — and being a husband, all the while being a Watch D.O.G.S. (Dads of Great Students) Chairman for my sons’ school district, comprised of twenty-three elementary and middle schools and is combined with the PTA Executive Board. Though I was skeptical of being a newbie author, Kristen Ringer lightened the load over the time it took to get to my Author Representative, Jamie Rath … and Jamie flawlessly choreographed the next sequence of events in that she always treated me like a person, with genuine dedication and not like a “herd” of cattle, quarterbacking from afar. This was like a mile relay with the handoff of the baton being swiftly executed in the exchange zone, or what we call in the track and field community, the “changeover box.” The changeover box is where the next leg or runner has ten meters to build up speed to take the baton onto the next relay. Kirsten and Jamie did just that. The epitome of Five-Star Platinum Customer Service is at the tip of its spear in Kirsten’s and Jamie’s work ethic and bottom line. They should be the trainers in their industry that others should emulate. Phone calls and email follow ups … who does that nowadays? Who actually cares to see the end product succeed to the next evolution and in this case to print? Kirsten and Jamie do care, bottom line, no bravo sierra. They are your “real deal” and the epitome of what we hold close to our chest in my community of Warriors: Honor, Courage, and Commitment, hands-down. Only because of their compassion and unwavering genuine determination to assist a new writer, much like a clutch quarterback navigates the football field, would I possibly write a sequel in the future. Please recognize Jamie Rath and Kristen Ringer at your next board meeting or Outskirts Press function; they unequivocally deserve it. Best regards and thank you for your time. We agree that Jamie and Kirsten deserves great appreciation for the work they do — and so too do all of our Author Representatives, Publishing Consultants, and other expert staff, all of whom work tirelessly on behalf of our Outskirts Press authors to produce the best possible experience and finished products: beautifully designed and marketed books that reflect each author’s voice and desire. And while we all eagerly await a sequel from Doc Morris, we hope that you too will consider publishing a work with us. You can find Doc Morris’ The Modern Day Mr. Mom on Amazon or in the Outskirts Press Bookstore at www.OutskirtsPress.com/Bookstore. To learn more about our work, please visit our homepage at www.OutskirtsPress.com, where you can find out more information about us and what we do, as well as use our website’s live chat feature to speak with one of our expert staff.